After receiving all of the empowerments, teachings and transmissions of the Nyingthig from Jnanasutra, Vimalamitra stayed for many years with him studying and practicing. He realized the naked nature of mind after receiving the utmost simple empowerment. Some years later, as King Trisong Detsun was establishing the Buddhadharma in Tibet, it was decided that Vimalamitra should go there to help with translation. Having clear sight, he knew that the time was right and accepted the invitation. For ten years Vimalamitra worked with a team of translators to translate many tantras and texts of Mahayoga. 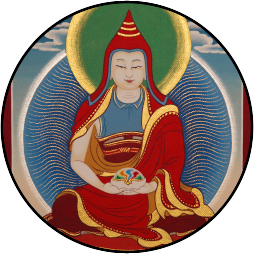 The Nyingthig teachings that were brought to Tibet by Vimalamitra are known as the Vima Nyingthig.